I get a lot of questions from readers about how to improve their photography, both from a beginner and more advanced perspective. 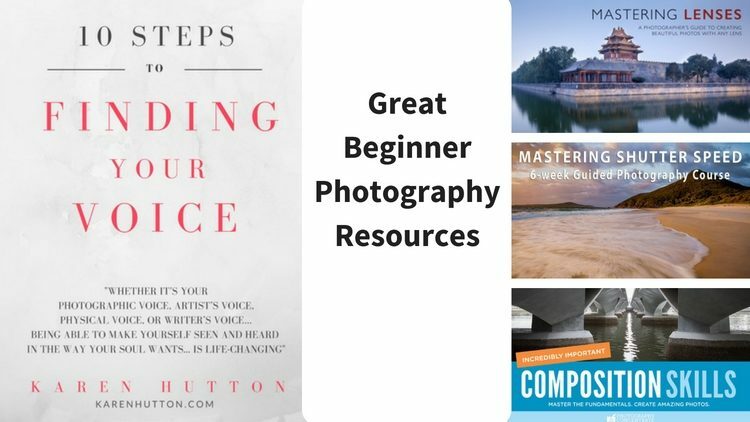 In this list, I'll give you several learning resources which I recommend that can help you if you are just starting out in photography. The intermediate photography resource list is here. An ebook by Rob and Lauren at Photography Concentrate. I've talked about composition in some past articles here on Digital Photo Mentor. It's a skill that you can learn which will have a great impact on taking your photography up a notch from being just snapshots, into making more artistic and dynamic images. These two are really good at explaining photography terms and concepts in a way that is really easy to understand and follow (I reviewed their Extremely Essential Camera Skills course here). 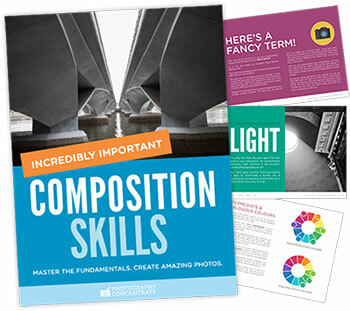 This ebook, Composition Skills, is 226 pages full of tips and examples to help you start composing and creating better photographs. It also includes some exercises for you to practice and the odd pop quiz so you can test your knowledge of what you've learned so far. It also comes with a really handy Field Guide that you can print, fold up and put in your camera bag to jog your memory with all this stuff once you get out there shooting. As a bonus, you also get seven videos that walk you through dissecting one image in each one. You can see how the composition is working for each image, and what elements are at play to make them effective images. That will help you apply the concepts in your own photography. Andrew Gibson is no stranger to DPM as he's written an article for us previously and we did an interview as well. You may also recognize his name as a regular writer on Digital Photography School, where I'm the Managing Editor. So I'm pretty familiar with his writing style and his work. What I know about Andrew is that his writing is consistently well thought-out, and he uses example images and diagrams that help illustrate the lessons so they are easy for you to grasp. Mastering and understanding how lenses work is something I teach as well in my courses, tours, and workshops. If you can get a handle on choosing the right lens to get the look and feel you want, your images will have more depth and meaning. It follows along well with the first book above on composition as the two go hand in hand. 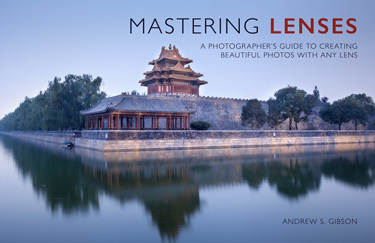 If you are ready to upgrade from your kit lens and aren't sure what to get, this book can help you make an informed decision by arming yourself with knowledge. 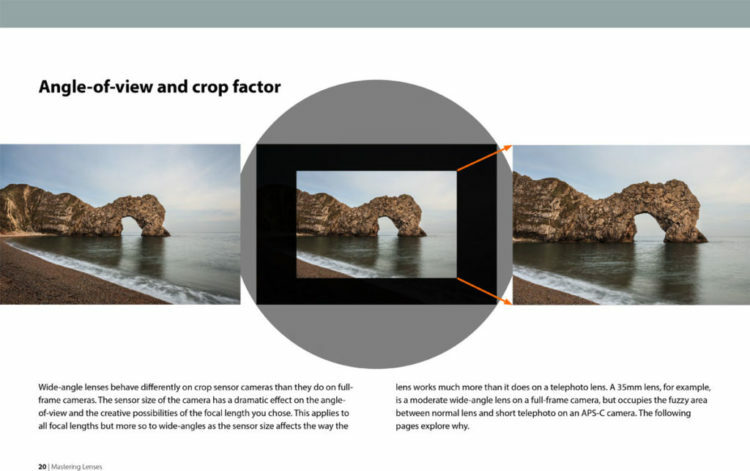 You'll learn about crop factor and how it plays a role with lenses. You'll also learn about angle of view and how it affects perspective and ultimately your image. Other things he explains are; tips for using wide-angle lenses, portraits and lens selection, prime lenses versus zoom, bokeh, fast lenses, teleconverters, image stabilization, and more. At the end is a lens buying guide to help you even further. For $14 this is a good value even if it just helps you make a purchasing decision, but you'll get much more out of it than that. Directly from her site: 70+ pages of stunning images, inspirational words, and well-explained concepts. Well if all you got from this ebook was to get inspiration I'd pay 10 times that price just for that. 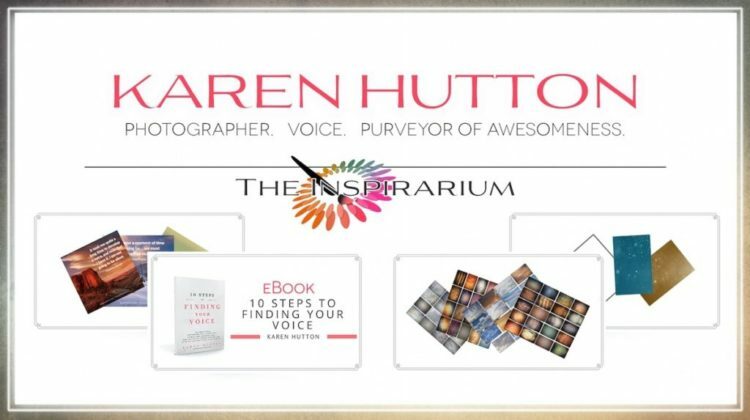 Karen's images are indeed stunning but how she has segmented this into 10 steps to help you find your voice is brilliant. That quote spoke to me before I even opened the book! Who doesn't want to be heard? Finding your voice and style in photography is something that I get asked about a lot. It's not going to happen overnight and it's not always easy. What Karen has done in this book is to give you some real practical things to do and think about to get you started on that journey. In each section of the book, Karen gets you to ask yourself a very important question. These are questions that not only define your photography but who you are as a person. For example, “What do you like to feel?” or “What is my favorite element, time of day, color palette, etc . . .?”. Your answers to these questions will help you start to define what you enjoy shooting and how you want your images to look to please your own eye. And in the end, that's all that matters is making something for you, something that feeds your soul. If it also speaks to others too, bonus. 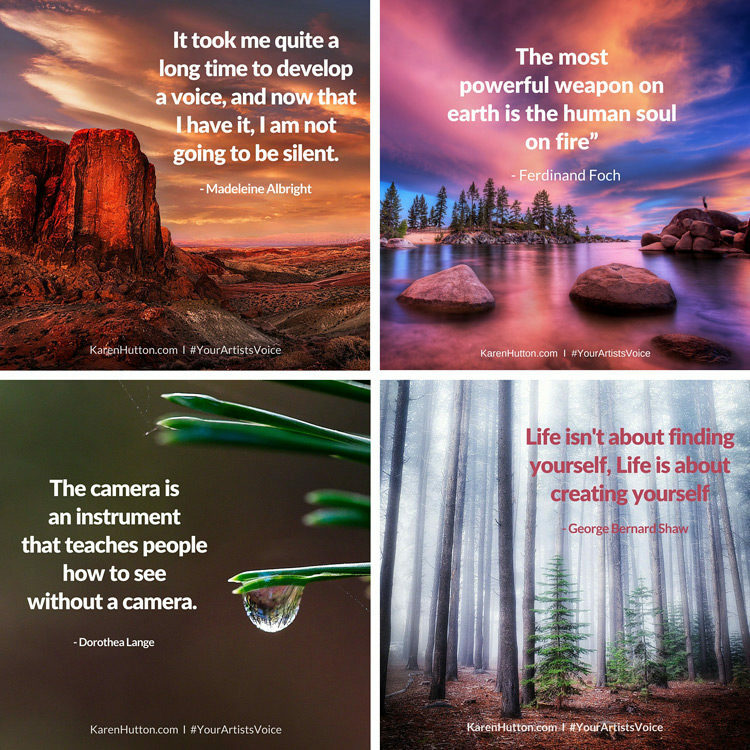 As a bonus, you also get 14 of Karen's images with inspirational quotes, as well as some texture overlays and Photoshop brushes to help you customize your images and add your voice! I'm in love with how simple this book is and how great it makes me feel just flipping through it. 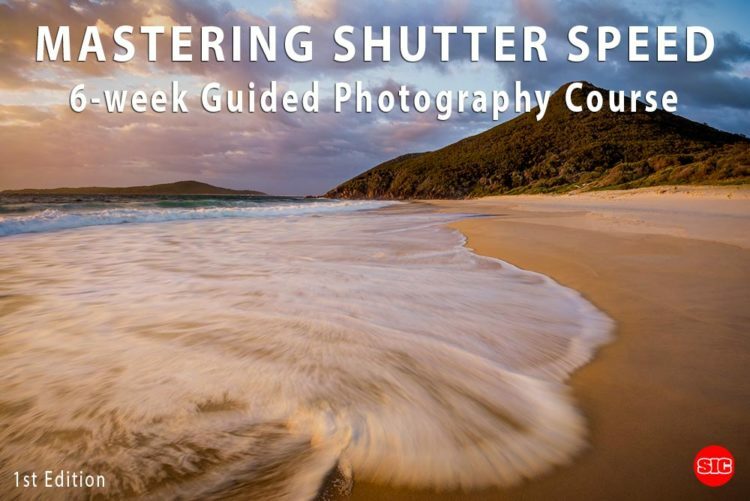 By the end of this course, you will understand shutter speed, no doubt about it. These guys know how to make learning fun. You may even laugh out loud a couple times, I did! This is SO NOT a dry slideshow ,classroom-type lessons course. Brent and Johnny have fun with it and you will too, in the 12 video tutorials all shot on-location. They use real-world examples to show you how shutter speed works and how it affects your images. From water balloons, panning skateboarders, shooting a “model” on the beach, shooting the tide coming in, to people moving in a crowded location. You will see and learn from a variety of scenarios that you can be applied to your own photography. In addition to the videos, there is also a discussion forum where you can post questions and images for each lesson. You can get maximum value by participating and posting your images and getting feedback from other students in the course and from Johnny and Brent. This is a super deal! 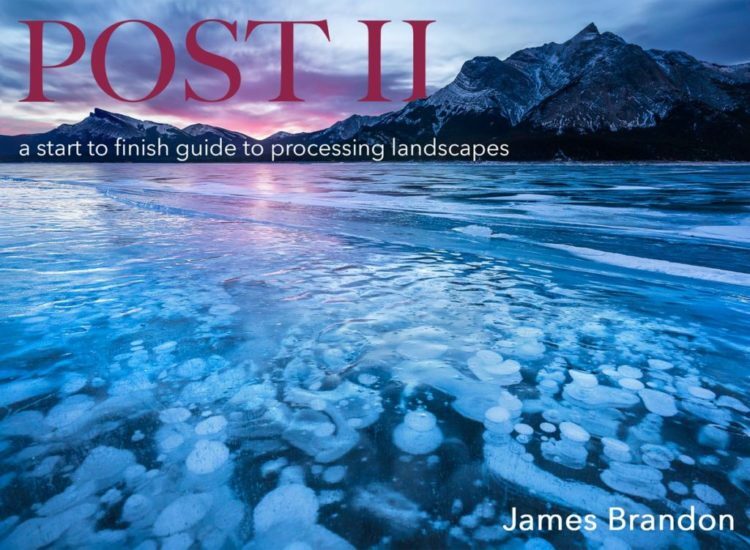 In this video series, James takes you through the processing steps for 10 of his landscape images. You get all the RAW files that he's using so you can follow along with him step by step. James goes nice and slow, and the advantage of video tutorials is that you can also pause them and rewind if you need to repeat anything. 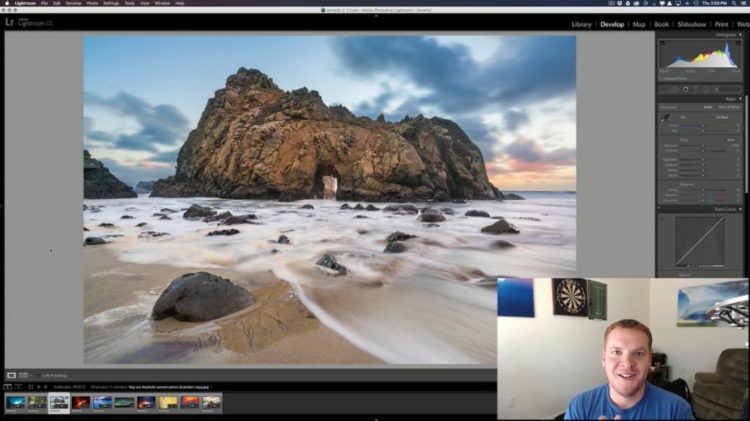 Even if you are new to image processing you will get some tips on basic processing, and what is possible from this series. If you are more advanced or have been processing your images for a while you'll likely get some good tips you didn't already know.